This is the first game in the Hardball series. For other games in the series see the Hardball category. Hardball! 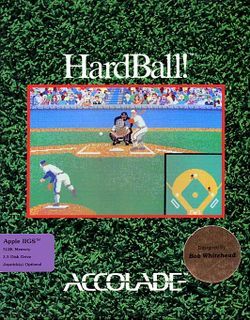 (typeset as HardBall!, also appears as Hard Ball) is a 1985 baseball game that was developed and published by Accolade. It made its debut on the Commodore 64, but with its initial success, it was soon ported to the Apple II, Apple IIGS, the XE consoles of the Atari 8-bit family, Atari ST, Amiga, MSX, ZX Spectrum, MS-DOS (in CGA and EGA), and eventually the Sega Genesis in 1991. One or two players is supported. This page was last edited on 28 September 2009, at 18:42.